This should be the last we write about student loans …we’ve written about it here and here. This post is to give you an idea how we paid them off in about 4 years. At the end of the post you will find a Google sheet where we have painstakingly documented every penny we racked up and how we paid them off. Granted we had a couple of things going on for us. One, both of us were working full time when we accrued these loans, so we were paying back right from the onset. Two, since we were paying them off since when they were disbursed, we avoided snowball of these loans. The loan balance changed over time, right from the beginning, based on when loans were disbursed and when (every month) we applied payments to them. We started with student loans in the fall of 2014. The first disbursement was $10,250 by Navient. The second one was in spring of 2015, again $10,250, again Navient. The third one was $7,500 in fall of 2015 by Discover. The fourth one was for $7,500 in spring of 2016, by Discover. Our total loan amount was $35,500. The fifth and final one was a consolidation of the outstanding Navient and Discover loans into a low interest Earnest loan of $ $15,284.50. This was not on top of the $35.5k but the balance left on that. We paid a total of $4,417.25 in interest on the loan, which is about 3.11% blended rate over the 4 year period we had the loans for. Here you go then, in glorious, excruciating details, the trail of money of our student loans. Another – pick your category: Personal Finance/Financial Independence/Early Retiring/Living Frugal – espousing blog? Kill me already! You see, the main point of this blog is to document what we are doing. Everything else is secondary. We don’t see this turning into a profit making machine. We don’t even envision making money off the blog, nor do we pursue any strategic or tactical ways for monetization. This is not some fall back option in retirement that will generate income. That’s not the purpose of this blog. Even though we hope to achieve Financial Independence sooner that most working Americans, we don’t think that is a realistic option for many, many folks. That is just facts. The median household income in the US in 2016 was $57,617. The top 10% households earned at least $175,000. Our household income for 2017 was a tad under $200,000 (and this year has gone past the $200k mark). This is not bragging or showing-off but being acutely aware of cold, hard, reality. We understand we are in a very privileged position. We acknowledge how lucky we are to be where we are. The *perfect* audience of this blog is someone who is in the similar income range as ours AND still not on the path to financial independence! We really hope we can inspire YOU – 30-something, probably dual-income, with kid(s), high salaried, white collar worker – to bring about a change in how you look at life, work, and freedom. Build your net worth and then control if you still want to go to the corporate job you have every morning. The answer could very well be yes, but at that point you’re making a conscious choice. Does that mean all others are excluded? Certainly not! Some of you reading this might be discouraged. Discouraged that the $60,000 job you have supporting your family of four is absurdly low to even think about retiring before 65. That’s not our intention. We hope you see what we are doing and take heart from it. We didn’t start off with these salaries when we got married. If you are serious about gaining financial freedom start working on YOUR net worth, with strategies strewn around in the FIRE blogosphere! If you’re in a very similar boat as us, welcome aboard! Would love to hear from you. Others who have gone through this stage we’re in right now – we ask for words of encouragement! Or witty admonishments. We don’t follow the typical FIRE truisms – we have 2 cars (with a loan on one! ), we eat out a few meals every week, we have cable, we still use an electric dryer, we have no side gigs. But we do everything in moderation. The car loan is 0.9% and we still pay more than the minimum payments; none of the restaurant meals are exorbitant; we love live sports; we run exactly ONE laundry cycle every week; and we don’t have time for side gigs (we had a rental for 2 years and sold it; too much hassle) with work, family, sporting, and volunteering commitments (and till this past February, part time school!). At least for the time being, we have absolutely no qualms and guilt about keeping it that way. And still be on track to be FIRE before our mid-40s, a couple of decades before the overwhelming majority of Americans do. As for giving advice about how to get started on this path, we think, make that we know, that there are other bloggers who have done this for a long time, in a fashion that is far better than we could (probably!) do. There is no need to reinvent the wheel. Though from time to time we might sprinkle in tidbits about some interesting concepts. At times we will do some deep-dives sessions on something new we learnt or a future-state plan. So, to recap. This blog is for anyone who cares about growing their money, and increasing net worth. We bask in the warmth (some would say “cold”; we beg to differ) of numbers. Everything you see in our monthly reports are what we are dealing in real life. No make-up, no mark-up. We took out student loans when one of us were in grad school. There were two loans taken out. The coursework of this program took 3 and half years. The total cost of this degree was about $80,000 including tuition, books, papers, case studies, “collegiate fees”, a two-week international component, parking – basically everything included. So we paid out-of-pocket for the remaining $45k. Earnest was the provider we went with and locked in a fixed rate of 3.25%. In the next post we’ll talk about our experiences with Earnest and a couple of other highly rated student loans consolidation services. We had mentioned in this post that our future annual expenses when we enter the FIRE phase would be $48,000. 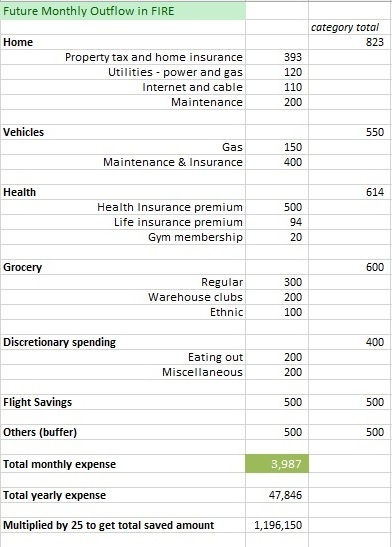 This is the breakdown of the the monthly expenses (rolled over into annual, rolled over to our final saved amount). Most of categories and sub-categories are self explanatory, I think. A note about the Flight Savings. We want to take a nice long vacation each year. The cost of flights is the highest component in a vacation. You can also rename this category in your mind as “Vacation Savings”. “Miscellaneous” under Discretionary Spending covers clothes shopping, entertainment, impulse buys. As you’ll notice, I had to include an “Others (buffer)” category to make it close to the annual $48K we were predicting! This tells me we will be revisiting our total saved amount in the future. After publishing this, we realize that we need to have a post about our current expenses, to give a true comparison of which spending buckets will be eliminated or curtailed. In the first post of this blog we mention that our goal is to be financially independent by 50. What this means is that at this point in our lives all our expenses will be funded by our investments, and we will have no need for any active income coming in. But HOW? To answer that first we have to take a couple of steps back. If you have read about the 4% withdrawal rate (and if you haven’t, please read that first; right now! and all the other posts under the Stock Series by Mr. Collins) you know that once you’ve saved enough where you can comfortably withdraw from your nest egg at the rate of 4% each year, you are set. Also, check this out by MMM. And this in-depth post by the MF. The question then becomes, what is the amount you need saved. Let’s call this x. What drives this x? Your expenses! When you’re FIRE you’re not saving, per se, anymore. You’re only looking to get the necessary amount every month for your expenses. We will talk about post-FIRE expenses more in a detailed post later. Let’s call our post-FIRE annual expenses y. Therefore, x = y/0.04 => x = 25y. Our total savings need to be 25 times our annual expenses. That it’s. If only we could determine y, our spending, we will know how much we need to save up, x. We have determined that our spending when we are FIRE will be $48,000 per year, at the most. Again, we’ll publish a post detailing this. For now, just know that this $48k does not contain any mortgage payment or college tuition for our child. Plugging in, our “Retirement” bucket need to be $1,200,000 before we are FIRE. The last step now. 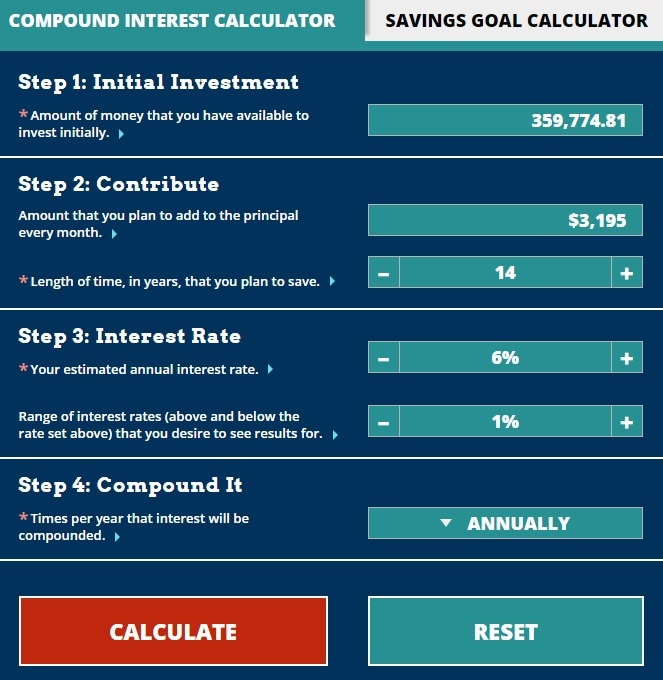 How long do we need to save till we have $1.2M in our retirement accounts? In January of 2017 we had $359,774.81 in our retirement accounts. Currently we are pumping in $3,195 every month into retirement accounts. Assuming a return of 6% annually, in 14 years, using this calculator we will have accumulated $1.6M. That is over $400k more than we need! – An annualized return of 6% over a long time period is very conservative in the first place. Also, as you’ll see in the screenshot, the tool gives your projection if your annualized rate was 5% and 7%. Even with a 5% return we still beat our projection of $1.2M! – We have assumed the monthly pay-in of $3,195 as a constant over these 14 years, when in practice this will certainly increase every year. – We are basing our projections ONLY on the retirement accounts whereas we’ll actually have money in our regular bank accounts and other investments. In short, all of our assumptions are on the VERY conservative side. Quite possibly we should be able to retire even earlier than the 50-year old mark that we have set for ourselves. 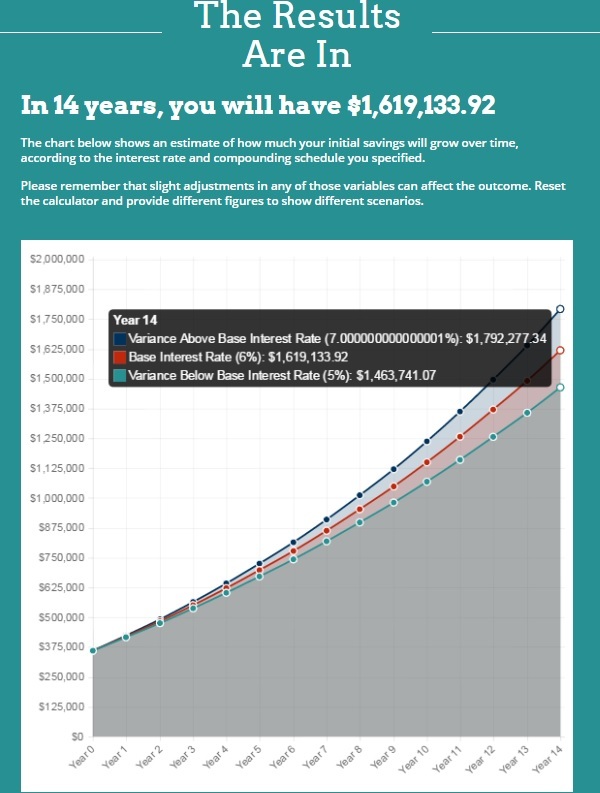 This FIRECalc tool is a great way to see the probabilities of how your money will last in retirement.